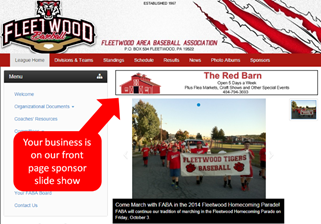 Established in 1967, Fleetwood Area Baseball Association (FABA) is a 501(c)(3) non-profit organization that provides local area youths the opportunity to learn sportsmanship, teamwork, and respect for themselves and others through a structured and supervised baseball program. Our organization is open to boys and girls from ages five to fifteen and no one is denied the opportunity to play due to financial reasons. Your sponsorship will be used to meet many different needs including purchasing new equipment to ensure the safety of our players as well as improvements to the fields where they play. If you would like to support FABA by being a sponsor, please download the "Sponsor Request Form 2019" form on this page.